On Thursday the families of Michael Brown and Eric Garner joined with the NAACP, the National Urban League, the National Action Network, the National Bar Association, and the Black Women’s Roundtable to call for a full federal investigation in the police killings of the two young men. The Rev. Al Sharpton was part of the event, and he was about to take questions from those assembled when the news broke that Attorney General Eric Holder intended to resign from the administration. Naturally, Sharpton had a few words for the occasion. That is high praise, but it’s hard to say it’s unreasonable or unjustified. When President Obama entered office, the Civil Rights Division of the Justice Department was in shambles, neglected by President Bush and staffed with a coterie of partisan operatives. Long-serving lawyers left the office, case files were closed with little explanation, political appointees sought to block liberals from career positions, and anti-discrimination efforts were few and far between. 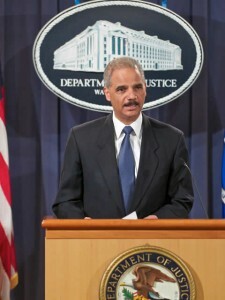 At his confirmation hearing at the beginning of Obama’s term, Holder made the Civil Rights Division his priority. To that end, Holder took aggressive steps to repair the damage of the previous administration and restore the traditional priorities of the Civil Rights Division. On voting rights, Holder was a strong advocate against voter identification laws, attacking the 2012 Texas law as a “political pretext to disenfranchise American citizens of their most precious right” and comparing some practices to Jim Crow laws. “Many of those without IDs would have to travel great distances to get them—and some would struggle to pay for the documents they might need to obtain them. We call those poll taxes,” he said. Posted: 9/26/14 at 9:57 AM under News Story.